Bright and bold basics are perfect for mixing and matching – like this fun, rainbow tweed yarn, set off with contrasting stripes! 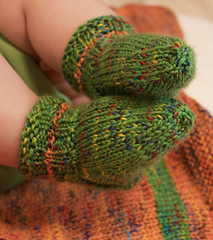 Baby will love these cozy, cheerful socks, knit to match or contrast with the Bright Stripe Cardigan! 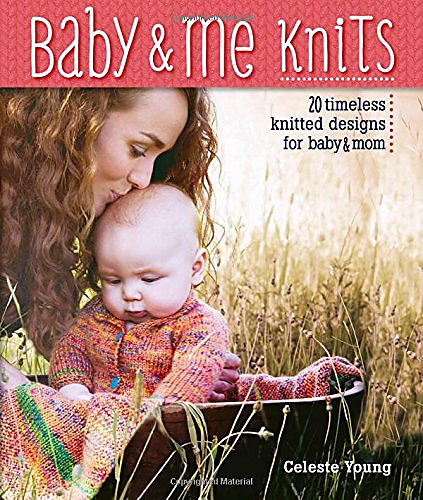 Larger needles are used only when casting on, to ensure that the cuff is stretchy and not too tight for baby! 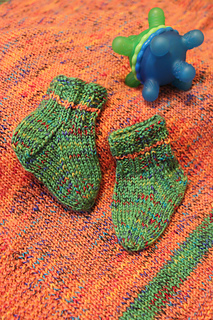 Yarn: Cascade Bentley (75% Acrylic, 25% Superwash Wool; 207 yd 200 m/100 g): #11 Lime (MC), 1 skein; #02 Tangerine (CC), 1 skein. Notions: Stitch marker, tapestry needle; scissors.